Dog Breed Artwork - Home of the Yin-Yang Dog Series! A gallery of artwork and available items featuring the dog breeds listed below - t-shirts (yin-yang designs and others), glass pendants, carved tagua pendants, wall art prints, original paintings and more! Missing your favorite dog breed? Is there a dog breed you would like to see in this list? Click here to tell me about your favorite breed! Once I make artwork of your favorite breed, I will let you know by e-mail. 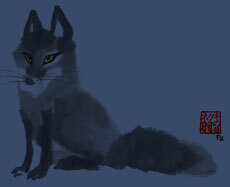 Here at the Foxloft, I am owned by dogs and am passionate about my pets. They are a constant inspiration to my artwork and design. I strive to feature the unique characteristics and charm of each dog breed. I have a wide variety of dog breed art, including dog breed t-shirts, jewelry, and wall art prints. They make a great gift for any dog lover in your life or a perfect treat for yourself! Our t-shirts are of the highest quality, printed and available direct from the artist. Looking for a fun gift idea for your pet sitter, dog-loving friend or family member? We have fine art prints ready to hang on your walls or display in an office to keep your dogs close to your heart. We also sell original artwork and offer custom designs in the yin-yang dog paintings - if we don't have the breed you love we can custom make it just for you! Custom paintings also make wonderful pet memorials or perfect designs for dog club specialty shows or fundraisers! You can shop by breed to see work of your favorite dogs from Afghans to Vizsla! Visit our yin-yang gallery - for a list of the yin-yang designs. 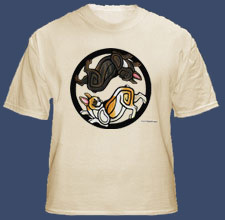 View all of our t-shirts - dogs, animal stacks and others. 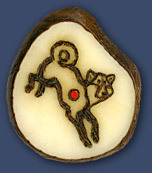 View our jewelry pendants - glass paintings, featuring dogs and various animals. I also make custom drums and can even design a tattoo for you!